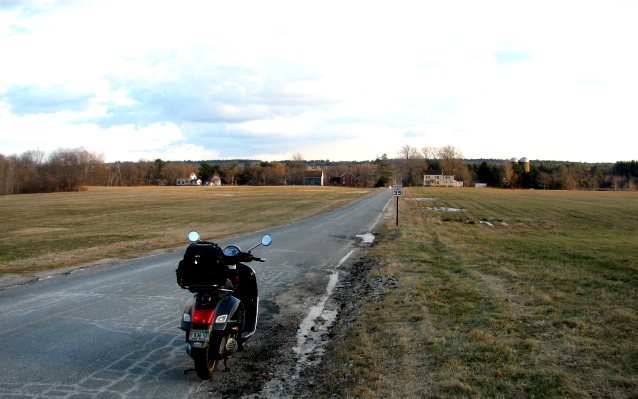 I prefer riding in the middle of the day during these winter days of limited light. 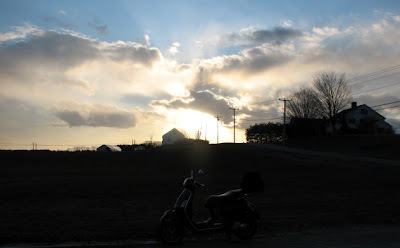 But yesterday, I found myself leaving home just an hour before sunset. 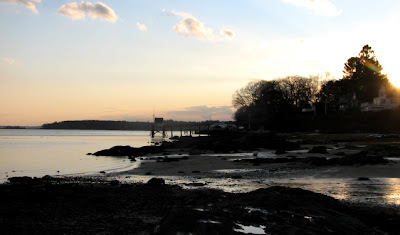 Riding through Falmouth on my way to the Town Landing with the sun behind me, I turned toward the sea and saw this scene. This won't make the Cloud Appreciation website, (http://cloudappreciationsociety.org/) but I thought it was an interesting scene. I took the photo from this spot. 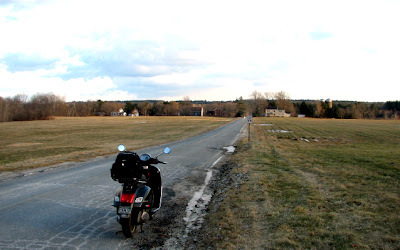 Ahead is just about the longest stretch of straight road on my ride to the Landing. It's low tide at the Falmouth Town Landing. In about six hours, my GTS would be six inches from the ocean. The pavement on which I'm parked is a launching ramp at high tide. Note the homes in the background; while many of us waste money on silly things, a home like these, in this incomparably beautiful place, is the perfect definition of wise investment. Above and below: Really nice backyards! Science lesson of the day: If the sea water was "wicked cold," the gull on the right would be standing on one foot. Gulls send extra warm blood to the feet when the weather is cold; as the temperature drops, one foot rises to get warm in the feathers while the other supports the hardy bird. Ducks have an inner layer of downy feathers that create an air pocket that traps body heats; the outer feathers are coated with a special oil secreted and spread over the body as the duck preens. I've got to believe this is the origin of the envious phrase, "Oh, you lucky duck!" Beautiful landscape to move through on a Vespa. 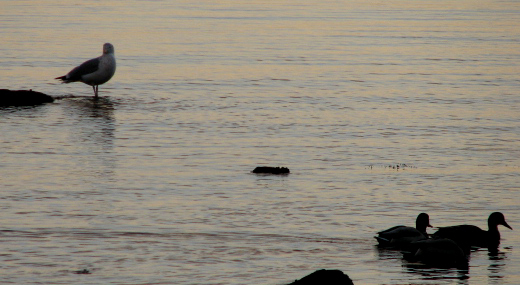 Makes me miss our annual pilgrimage to Maine. Can't help but think of salt spray and your pretty scooter. Any indication that the sea is creeping up on the Vespa? I'll be thinking of your "gull" lesson next time I'm in my down jacket shifting from one foot to the other! Steve - You are 540 riding miles from Portland; a mere 436 miles by crow. 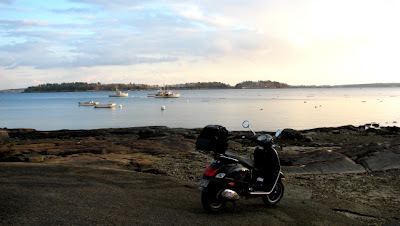 Should you make it to Maine this summer, I'll take you to the Falmouth Town Landing, where we can park our Vespa's on the boat launch at low tide. 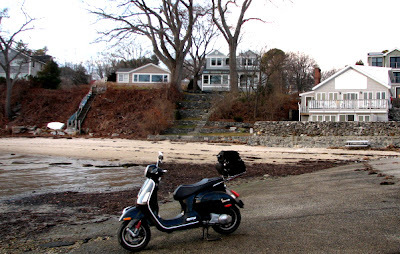 We could make a video of the incoming tide, playing a game of Italian chicken - first man to move his Vespa buys dinner. Rumor is snow will actually fall, accumulate, and even stick around for a few days. Hopefully, this will mean interesting clouds. I'm grateful to have the piece of information about gulls leg warming habits, although I can't think of a good reason why. I like the light play in the photo of the homes. Circle Blue - We got about 8 inches of snow today, but it's currently raining. I hate the thought of tomorrow's roads! Regarding the lack of a good reason for seemingly useless information, consider how utterly without usefulness this fact is: More people are killed by donkeys annually than are killed in plane crashes. But - if one really wants to lose weight - this off-the-wall fact is golden: Celery has negative calories! It takes more calories to eat a piece of celery than the celery has in it to begin with.